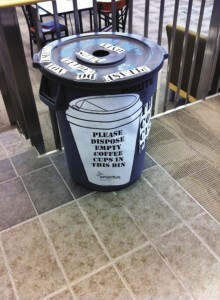 Coffee cup recycling bins put on campus to promote a more sustainable lifestyle are, unfortunately, not used very much. With Tim Horton’s Roll Up the Rim campaign, thousands of cups are being used and tossed each day. Tim Horton’s cups are surprisingly also the number one item found in landfills. This plastic coating is used on the inside of coffee cups to make them water-proof. Enactus, an international non-profit organization geared towards community projects, has created a recycling program at Mount Royal. 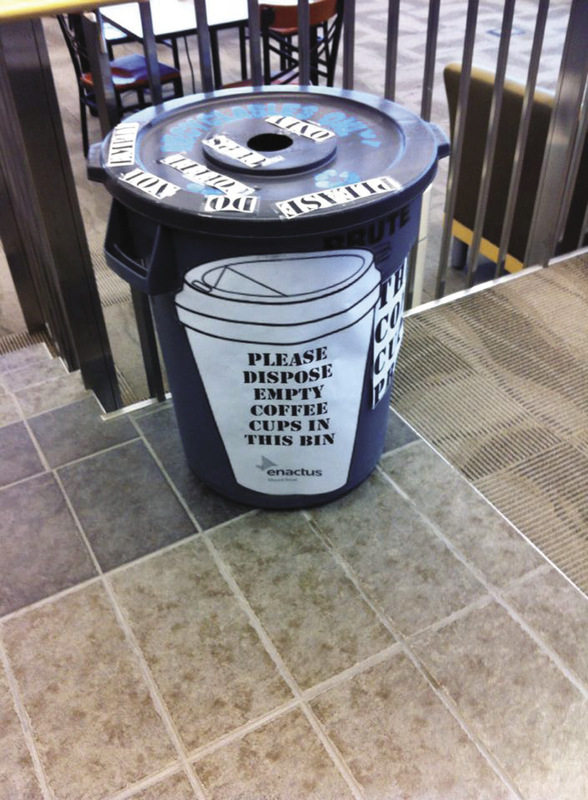 The student-lead organization has put bins on campus where students can toss old cups. “We take the polypropylene layer off of the cup and then the cup can be recycled. We’re hoping to turn these cups into different products, such as insulation,” said Lang. Unfortunately, students aren’t utilizing the bins to recycle their cups that much. Shahla Hussain, Enactus lead for The Coffee Cup Project, said the bins were lent to Enactus by the custodial staff at the university for free. She said she believes that the reason they aren’t being used is due to a lack of awareness. “Students should definitely be using the bins more. That’s why they are there,” Hussain said. Hussain said the program began developing earlier this academic year, with multiple products being tested. Hussain said her goal is to see bins overflowing with cups so that they can create new products. Enactus is also looking for any ideas that students have for products. Students with ideas can contact Hussian at Enactus at enactusmountroyal.com. Bins are located in the EA, EB and EC buildings.